In what’s becoming a daily occurrence, yet another bank is upping its financial ante when it comes to dealing with customers who make a late payment. This time, that institution is Bank of America. Dow Jones reported today that the heavy hitting financial institution has begun sending out notices to some customers that warn late payments could result in up to a 30% penalty increase in their APR. These notices are being sent out in anticipation of another tool the bank plans to incorporate in its efforts of offsetting the restrictions the new banking laws have in place. Because it will send any customers who will face the penalty rates at least 45 days prior to doing so, it’s all legal, per the new federal banking laws. While the bank said it wouldn’t be implementing these sky high rates for all its late paying customers, it did provide a few decision guidelines it will be incorporating. Those who have had prior late payments are in jeopardy as are those whose credit scores have dropped since the initial credit card was issued. Another likely factor will be the habits of the card user. If he flirts too closely with maxing out his credit card, there could be a substantial interest rate increase. A Bank of American spokesperson told reporters that a single late payment wouldn’t automatically mean an increase; further, it was reiterated that each account would be personally reviewed before any decision to raise the interest rates is made. It’s important to note, however, Bank of America found itself in a scandal in late 2010 for instigating foreclosure proceedings against its customers only to reveal later those foreclosures hadn’t been closely reviewed. Some bank officials were routinely blindly signing notices without ever looking at the documentation. 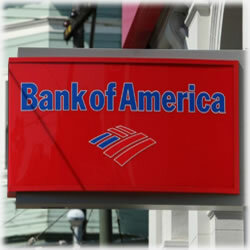 It was announced earlier this year Bank of America was considering a higher annual fee for its card holders. There are some card holders who currently have no annual fees at all; that could soon change. Like this latest announcement, it appears the bank is only focusing this effort on its customers with lower FICO scores or who have had a late payment or two. Just as with the new $59 annual fee some customers are now facing, a credit card consumer can simply not charge anything else on his card and then close the account once it’s been paid to avoid these penalties. Further, if the new APR goes into effect, it won’t be applicable on one’s current balance and will only be incorporated for any new charges made after the June 25 increase (and per the specifics in the notification). It should also be noted, too, that if Bank of America discovers late payments on any of your other accounts, it can incorporate what’s known as “risk based pricing.” Again, it must first provide a 45 day notice before the change goes into effect and it won’t be applicable to charges made before the increases kick in. Betty Reiss, another Bank of America spokeswoman said today that for any increases to a consumer’s credit card rates, his account will reviewed twice a year for potential reductions in their rates (the technical term Bank of America is using is “penalty rates”). That said, the bank isn’t extending this as a courtesy to their affected customers; it’s a requirement in the 2009 CARD Act. There are other comparable options for credit card users who wish to rethink their financial relationships with Bank of America. The Chase Slate Vertical Credit Card is one of those options. This card has no annual fee and the introductory APR of zero percent is good for up to 15 months. Plus, Chase Slate credit card users are afforded a balance transfer option. It’s one of the industry’s highest rated credit cards at this time and it could well prove to be the right solution for your credit card needs. The BlueprintSM allows customers to pay down their balances faster, which also equates to interest rate savings. To learn more about the Chase Slate Vertical Credit Card, visit our review and the terms and conditions.